You are here: Home / Where is Roca Verde? Roca Verde Climbing covers the area in and around the Cantabrian mountain range of northern Spain, the Cordillera Cantábrica. 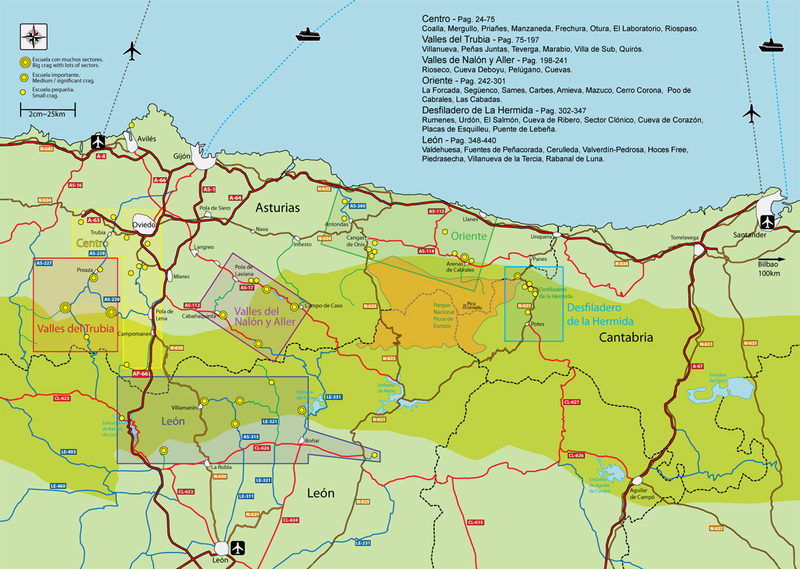 The northern slopes are in Asturias and Cantabria, with León to the south of the range. You can also download this map here…. Air – Santander or Ovideo (Asturias) airports are easy to get to from major European destinations. From the UK Easyjet fly to Asturias & Bilbao from Stansted and to Bilbao from Manchester. Ryanair fly to Santander from Stansted too. Bilbao airport is a bit further for central Asturias but is perfectly acceptable for La Hermida. Boat – Santander and Gijon are both major ports with car ferry links. Brittany Ferries cross from Portsmouth and Plymouth in the UK to Santander all year round. They also go to Bilbao from Portsmouth. LD Lines go to Gijon from Poole in Dorset and from St Nazaire in France. Roads – The motorway heading west from France is quiet, fast and only has a small toll section. From the south of Spain the A67 comes to Santander while the A66 crosses Leon to arrive in Oviedo.